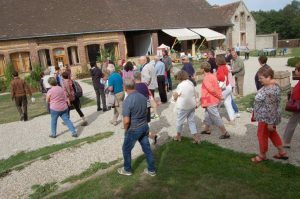 The art of sharing was the theme which fueled the celebration of the 35th edition of the Heritage Days in the former abbey of the Court Pétral. 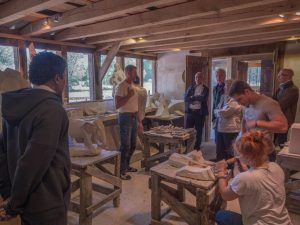 The historical site opened to the hundreds of visitors who arrived for the occasion and participated in the activities proposed by the Friends of the Court Pétral and its collaborating associations such as the workshops of Hephaestus and New Acropolis, in addition to the many participating craftsmen. 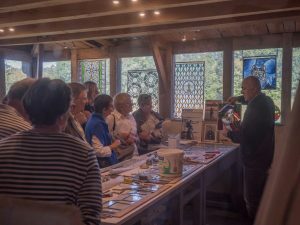 Activities included a guided tour of the church and the old cloister; introduction to metalsmithing, stone carving and stained glass workshops, learning about beekeeping, etc. At the end of the visits participants enjoyed a pancake tasting accompanied by cider. On Saturday night the audience attended a concert by the Orpheus choir that offered songs about sailors and mountaineers.